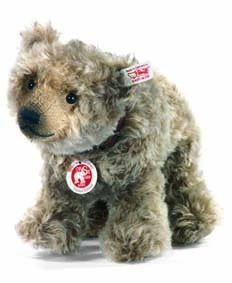 This Steiff bear is made in 2013. Made out of white mohair with purple Irises embroidered. She is 30 cm. / 12" tall. Made out of brown tipped white mohair. Limited to 1.500 pieces for Europe except Germany, Uk and Ireland. Made out of brown tipped mohair. She is 15 cm. / 6" tall. With red cotton dress and felt Edelweiss flower. Made out of sand colored mohair. With music box "My Way". Limited to 1.500 pieces for Europe except Germany. 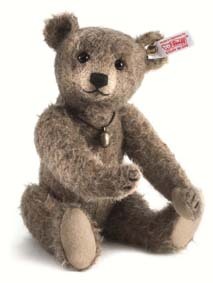 The Rattle Bear is made out of grey blond mohair. 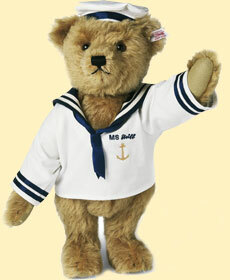 Fully jointed, stuffed with synthetic filling; with safety eyes and with rattle inside. He has a miniature rattle around his neck. He is 27 cm. / 9.6" tall. He is made of caramel tipped mohair. He has a special mechanism inside his body (originally developed in the 1920's) that enables his head to move when his tail is being turned. He is made for Europe and limited to 1.500 pieces. 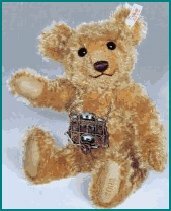 This wonderful clown is specially made for Berelijn and Tina`s Teddybörse in 2006. He is 13 cm. 5" tall and limited to 1.500 pieces. 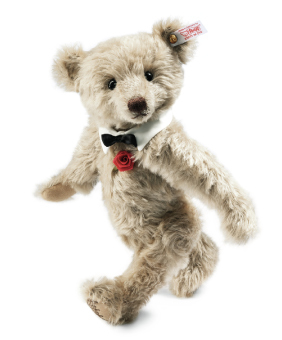 He looks like an old clown Steiff made in a very limited edition in 1912. 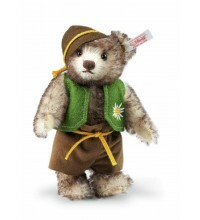 He comes with a felt cap and a felt collar. 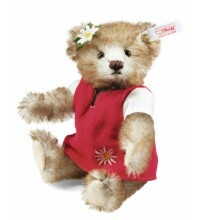 This bear is specially made for Holland, Belgium and France. All those countries have wonderful harbours as Amsterdam, Antwerpen and Marseille. The bear is 35 cm. / 14" tall and limited to 1500 pieces. This is a 32 cm. / 13” bear. In his hands he is holding a fish and a barrel. Herring is the only fish Dutch people eat raw. This bear comes in a bag. Be aware his transport box is missing. 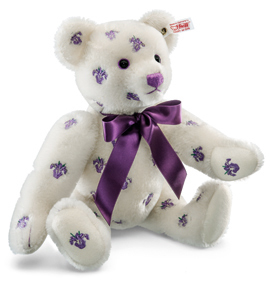 This bear is made in a limited edition of 1.500 pieces. He comes with a pewter medallion of the first hand organ that played the streets of Amsterdam. The bear is 35 cm. / 13” tall.